Whangamata wedding videos – A enjoyed a very chilled day worthies two cool cats at Waihi beach at the end of summer. We have put together a small wedding trailer you can enjoy from our antics. Our couple were married at ‘On The Beach’ wedding venue in Waihi Beach and we utilised the eastern end of the beach and estuary for photos and video. The weather calmed late in the afternoon and the estuary was lovely and quiet. The bridal party partook in a few drinks and nibbles while we worked our magic. See below for a sneak peek. 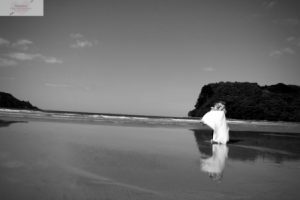 Whangamata, Whiritoa and Waihi all offer natural Coromandel beaches that look untouched and perfect for amazing wedding photos. These areas are also full of estuaries, parks and border on native bush that you can use to complete your wedding photo portfolios. We have the pleasure regular to shoot videos in Waihi and Whangamata and we love them. Being based in Tauranga we always enjoy the short drive to Whangamata and Waihi beach. It feels like we are on holiday as soon as we arrive in these cute Coromandel towns. We know all the top photo locations in each area we will happily pass these on to you for your wedding day! We would love to work with you to produce amazing photos for your wedding day in the Coromandel. Reach out to us, we can hep you with more than just photos and video. We know great wedding suppliers in the area and can help with time lines, seasons and wedding venues we can recommend. We like to offer advice on excellent wedding celebrants too so contact us now for unbiased advice and handy hints to perfect your wedding day.